The alate vivipara (see second picture above) has the posterior sclerotization reduced so the siphuncular cones are separated and large. There are sclerotized patches or transverse bars present posteriorly. 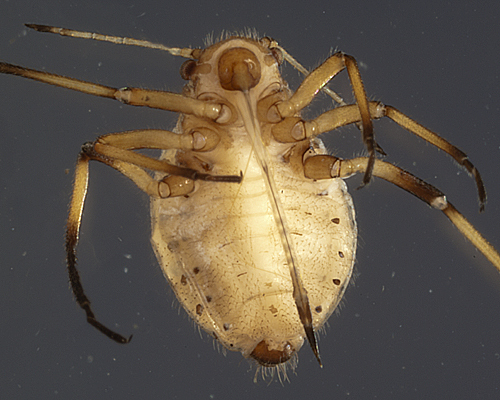 Oviparae also have extensive dorsal sclerotization on the posterior of the abdomen, as well as a bright white pericaudal wax ring and waxy powdering on the sides. The micrographs below are dorsal views of an alcohol-preserved Cinara brauni adult aptera (first) and a fourth instar nymph (second). In adult Cinara brauni the continuous dorsal sclerite extends across abdominal tergites 5-7, with a separate transverse band on tergite 8. In the fourth instar nymph there are separate sclerites on each of tergites 5-7 and the siphuncular cones remain separate. Cinara brauni is a polymorphic species with regard to extension and general aspect of the sclerotization of the abdominal tergites 5-7 throughout the year. 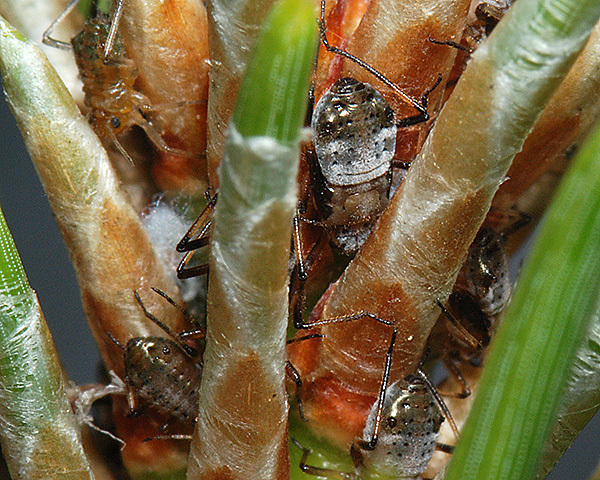 The eggs laid on Corsican pine the previous year hatch in spring, and the nymphs develop on the growing tips of the pine trees. 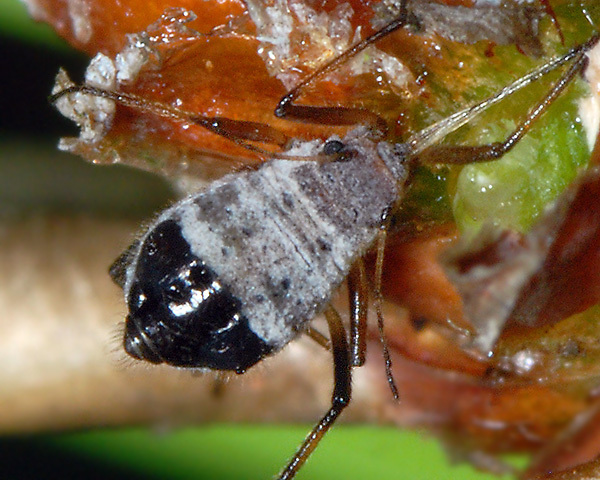 The two pictures above show developing nymphs on Corsican pine. 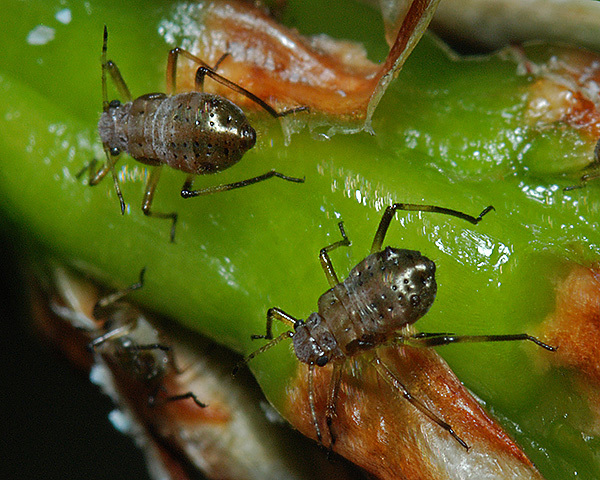 All are alatiform nymphs showing the developing wing buds earlier than the more usual fourth instars stage. 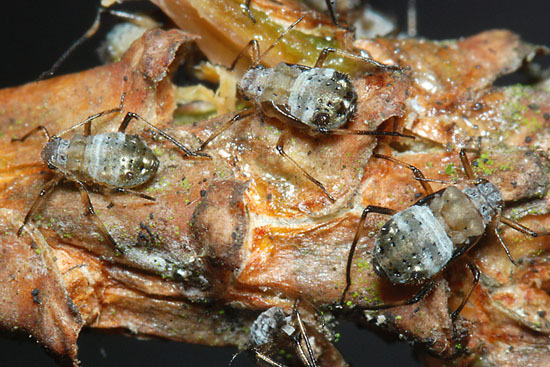 The picture below shows fourth instar alatiform nymphs that have moved from the growing shoot to the young branches. However, differing feeding sites in relation to age is by no means the rule, and all ages of Cinara brauni can be found feeding together on the current years growth. The long rostrum of the nymph relative to the body length suggests it may occupy the same feeding site as the adult. 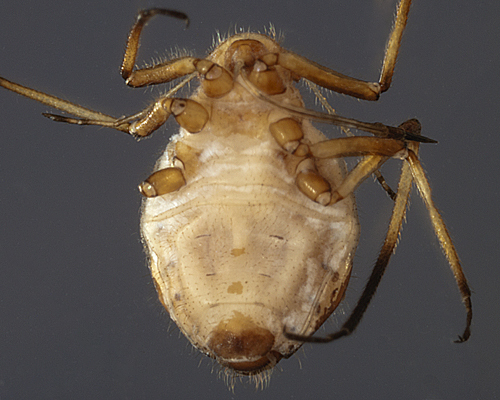 The rostrum is visible in the pictures below which show a ventral view of an alcohol-preserved Cinara brauni fourth instar aptera (below first) compared with a ventral view of an adult aptera (below second). As for ant attendance, Binazzi & Scheurer (2009) report that Cinara brauni is optionally dependent on ants. 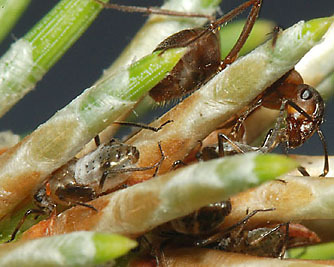 Some of the (rather dispersed) colonies of nymphs we have found were not attended by ants whilst others were. The first picture below shows a southern wood ant (Formica rufa) around nymphs whilst the second picture below shows an ant actively tending an adult of this species. 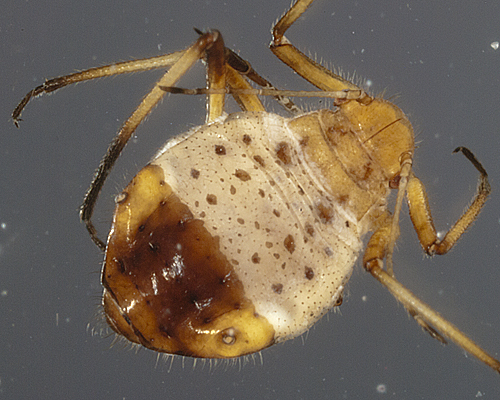 Adults tend to be more closely attended than nymphs. 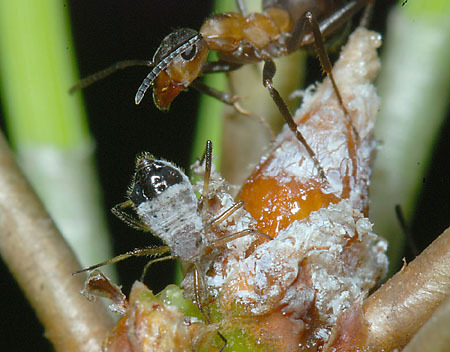 Núñez-Pérez & Tizado (1996) reported that in Spain the aphid was attended by the ants Camponotus piceus and Lasius niger. 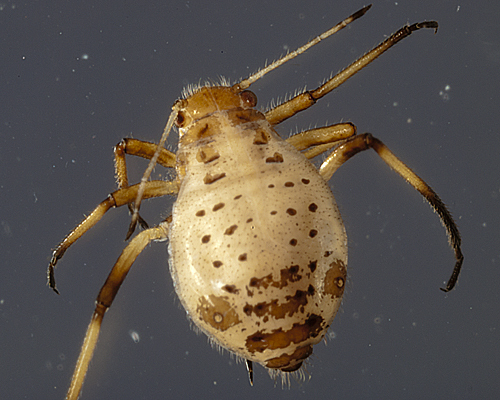 We have yet to find any predators attacking the Corsican pine shoot aphid, but we have found what appear to be nymphal mites attached to fourth instar nymphs. One of these can be seen on the thorax of the nymph shown above. Parasitoids recorded by Núñez-Pérez & Tizado (1996) included Pauesia picta, whilst predators included the coccinellid Exochomus quadripustulatus and larvae of the syrphid Sphaerophoria scripta. 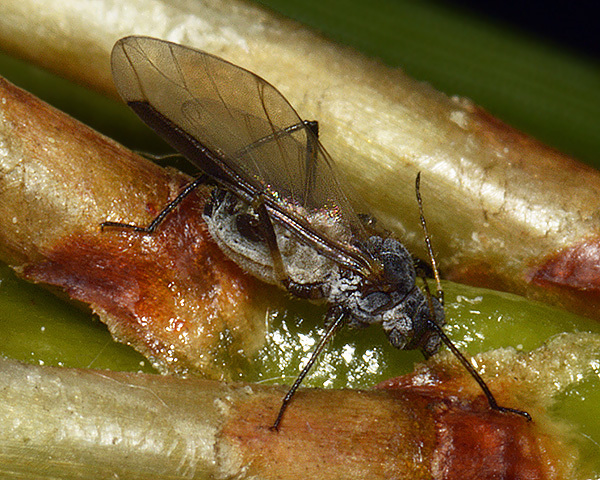 Blackman & Eastop list about 21 species of aphids as feeding on Corsican pine (Pinus nigra) worldwide, and provides formal identification keys for aphids on Pinus. Of those species Baker (2015) lists 12 occurring in Britain: Cinara acutirostris, Cinara brauni, Cinara pinea, Cinara pini, Cinara pinihabitans, Cinara schimitscheki, Eulachnus agilis, Eulachnus brevipilosus, Eulachnus rileyi, Pineus pini, Schizolachnus obscurus, and Schizolachnus pineti. There is not much information on any damage caused by Cinara brauni, but given they feed on Corsican pine, an important forestry species, the potential for damage is clearly there. Masutti et al. (2005) report that Cinara brauni, along with Eulachnus species, causes great damage to Corsican pine making the needles fall due to the large amount of honeydew accumulated and the consequent coating of a dark sooty mould called fumagine (fungi of the order Erysiphales). There are also reports of economic damage in arid areas because of increased needle fall.